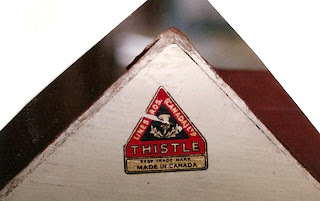 Canadian & New Zealand Tri-ang Collectors - Can You Help? 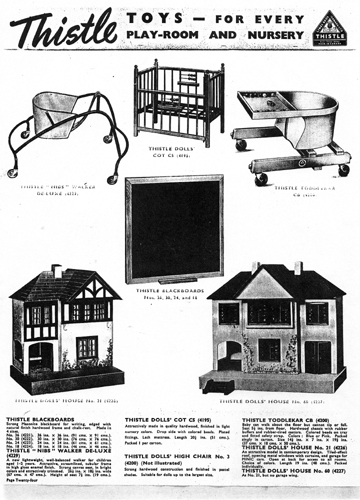 Internationally renowned vintage dolls house expert Marion Osborne is currently embarking on a brand new updated and far more comprehensive version of her Tri-ang dolls house book and wonders if any Canadian and New Zealand collectors can help. Or indeed, if anyone else out there can help? Triang had a factory in Montreal - Canada in the late 1940s and through to the early 1970s. The trade mark used in Canada by Tri-ang was "Thistle" as you can see from these pages from a "Thistle" catalogue and the photo of an old label below. 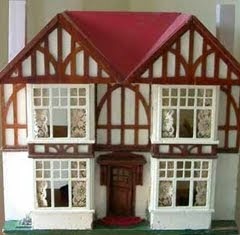 But exactly how many dolls houses and what particular designs were made is unknown. Does anyone have any information/specific details that can be passed onto Marion concerning this? No matter how irrelevant you think your information may be, please don't be shy in coming forward. Your information could prove invaluable in Marion's research. 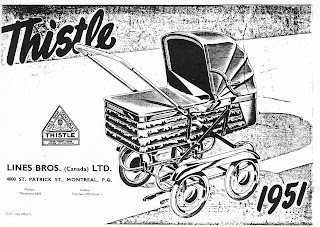 There was also a factory in New Zealand, where Triang bought Joy Toys and made at least a No 50 with metal front and a New Zealand label. Marion would love photos to illustrate this so does anyone have one of these? There is no known catalogue as far as she knows in existance. If anyone can help Marion, please contact me and I can pass on the info to Marion in the first instance. Then I am quite sure that Marion would wish to contact you herself. 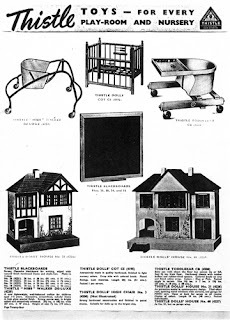 Featured In Latest Dolls House & Miniatures Scene Magazine. 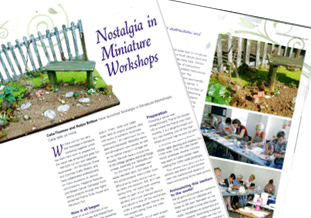 If you have the latest copy of Dolls House & Miniatures Scene Magazine you will find a feature on our first Nostalgia In Miniature Workshop that took place in June earlier this year. You will also see that if you sign up to Dolls House & Miniatures Scene Magazine email newsletter before September 14th, you have a chance of winning a space at our October workshop! Just to say that we only have 5 spaces left for our Down The Little Garden Path Workshop that is taking place in 3 weeks time on September 18th. If you would like to book a place, please get in touch asap by email or phone. 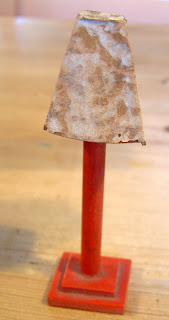 PLEASE SEE OUR OFFICIAL NOSTALGIA IN MINIATURE WORKSHOPS WEBSITE FOR FULL INFORMATION PLUS A DOWNLOADABLE BOOKING FORM. 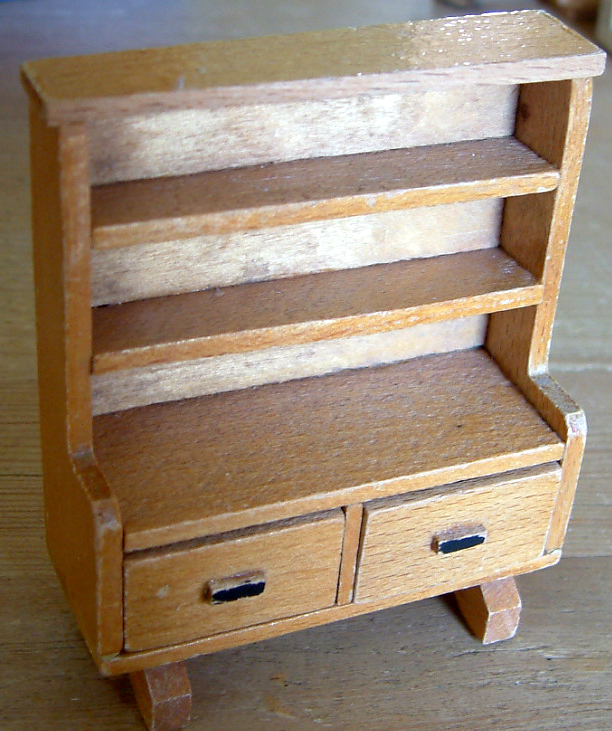 Now that my holidays are well and truly over, I am currently in the process of listing various vintage dolls house items up onto KT Miniatures website. Below I have highlighted some of the more interesting pieces that have just gone up for sale - all are 1/16th scale. 1950s Dol-Toi Dressers.......these are rather delightful, with opening drawers and an array of shelves to display miniature crockery, kitchenware and foodstuffs. 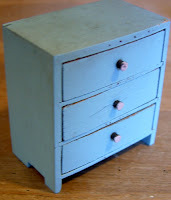 These style dressers surprisingly do not come along very often so is quite unusual for me to have two in stock at the same time. Here you can see a Dol-Toi metal frying pan of chops and a metal saucepan of stew? Would certainly help make your vintage dolls house kitchen interesting. Please go to the Dol-Toi Page to view full info of these and a lot more. 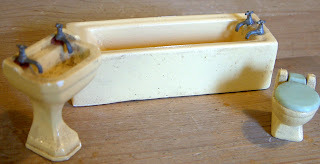 On the Barton Page you will find a 1950s plaster bathroom suite. These vintage plaster pieces are becoming more difficult to find in good condition, as in little hands they were most definitely vulnerable. This particular suite has a few nibbles but refreshingly no major cracks plus all taps are present and correct. There is the original lift up plastic toilet seat too which is nice. Amongst one of the more unusual Barton pieces is this wooden standard lamp with mottled painted cardboard/thin wooden lampshade. 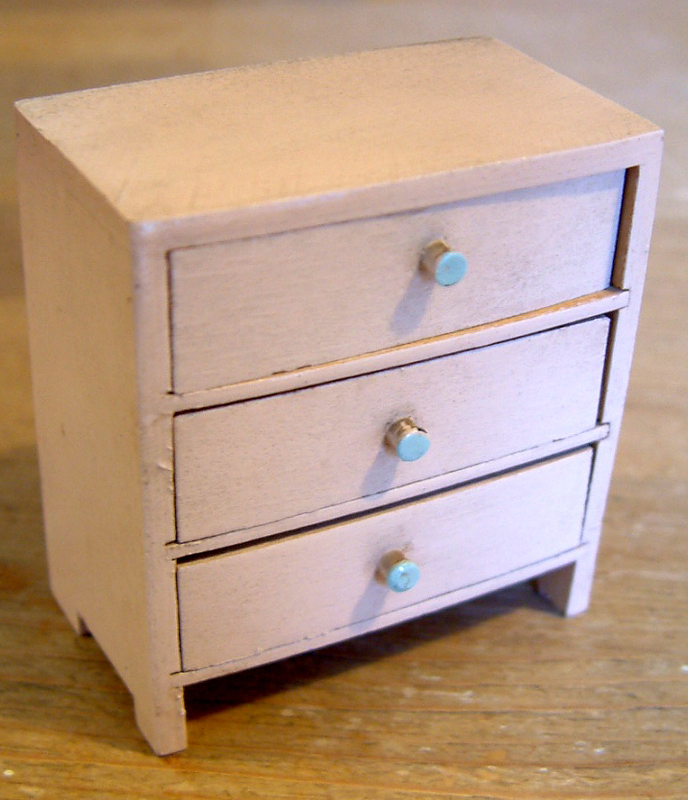 These little Barton pastel painted bow fronted chest of drawers are adorable and would brighten up any vintage dolls house bedroom. 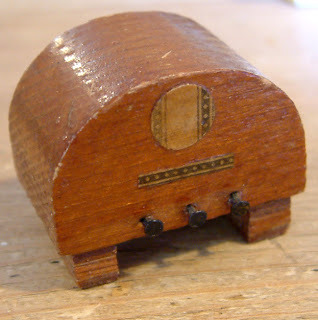 On the vintage 1/16th Others Page you will find this unusual post war wooden wireless. These immediately recognisable little Dol-Toi wire dolls, bound in wool with lead feet and plastic heads are in a good played with condition. 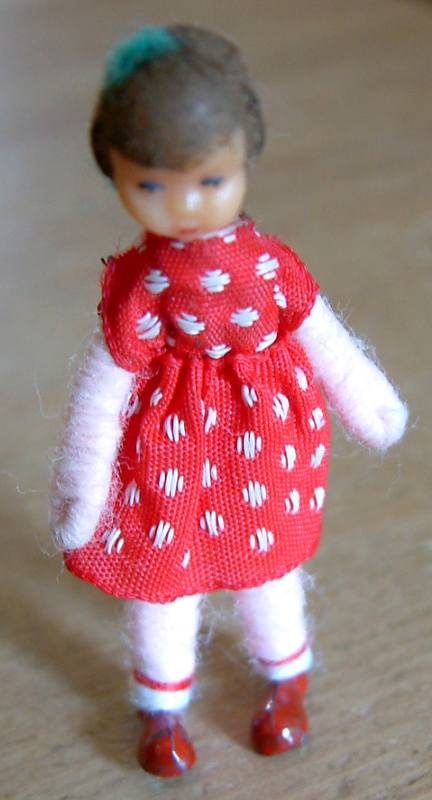 There are two little girls in red spotty dresses available, plus there are other various dolls available too including this very odd figure below! Have you ever seen a figure like this before? 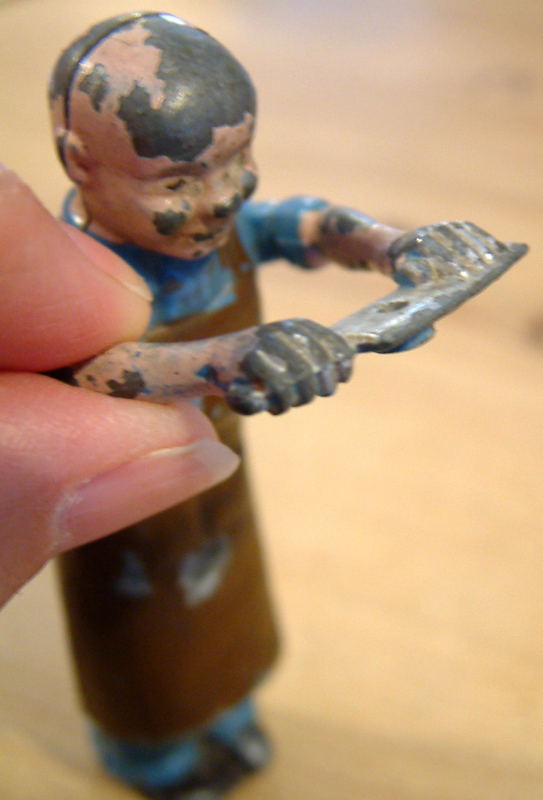 This metal butcher figure came in with some old dolls and I have not a clue of the maker or exact age but he is old. 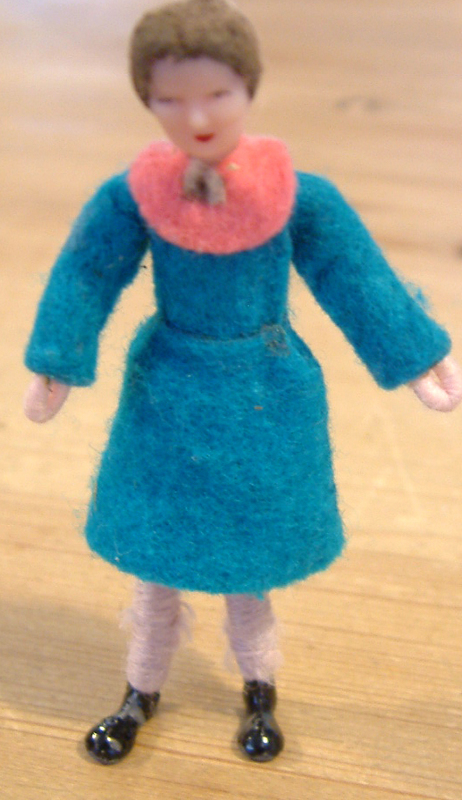 He may be considerably worn but there is still something rather charming about him - don't you think? He is holding a chopper and his arms move up and down. He measures 3 1/2" tall. 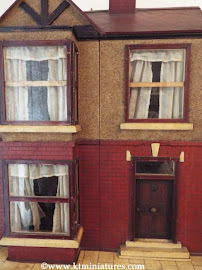 If you have an old dolls house shop or kitchen then this could be ideal for you.The dolls can be found on the Old Dolls Page. If you wish to order anything off KT Miniatures website, please remember to email or ring to check availability first then a reserve can be placed whilst payment is being sorted. 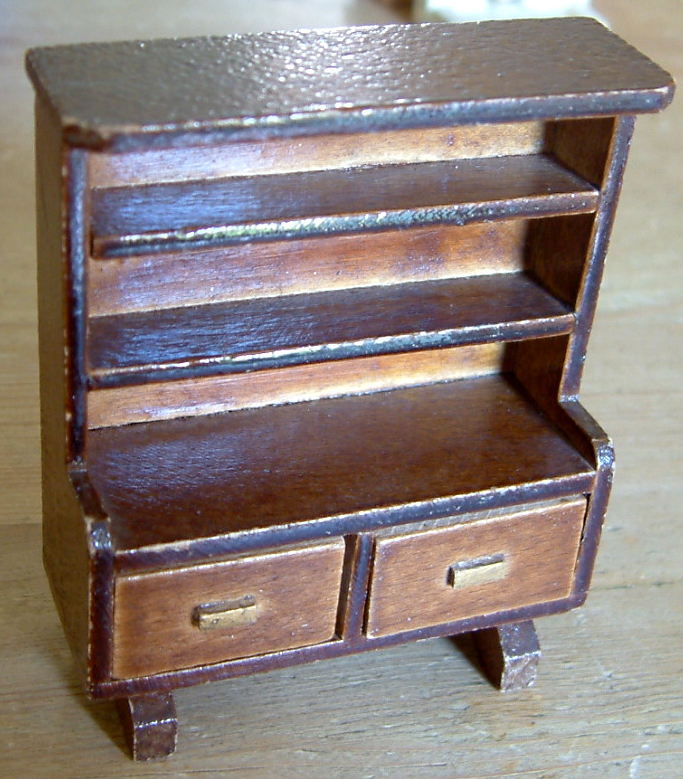 I have a lot of vintage items to add to various sections of KT Miniatures over the next few days so do keep checking the various sections. 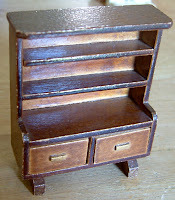 It has been brought to my attention that over the past couple of weeks or so whilst I've been away on holiday, some people have been experiencing problems whilst trying to email me directly from the link on KT Miniatures website. Apparently it has been failing to send and has been bouncing back on each attempt. I can only apologise. At first, it was thought that it was probably due to my inbox being very full whilst I was embarking on my wonderful (she says dreamily) few days off!!! However, even when the inbox was cleared, emails from my website link were still not getting through. My techno director aka Mr KT, has taken a look at it at our end and yep, as predicted, diagnosed that he could find nothing wrong with it at all! I have long given up trying to fathom out this techno stuff as often these things happen for no reason and can sometimes disappear again as quickly as they sneaked up on us...grrrr? The only thing we could think of doing was to re-apply the link. We have tested it from various computers and so far so good....fingers and absolutely everything crossed, visitors to my website can now happily email me without further hitches. Just a quick reminder for anyone who either lives in Jersey or may be going to Jersey this weekend, that the Jersey Dolls House & Miniatures Club Exhibition is taking place this Sunday - August 21st from 10.00am - 5.00pm at St. Brelades's Parish Hall, St. Aubin's Harbour, Jersey. 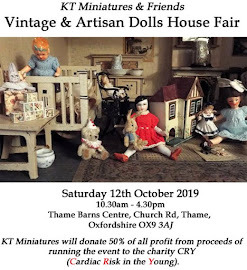 Barbara Kendall-Davies tells me that the theme is market stalls and there will be dolls houses and room boxes on show plus a competition with questions based on the objects in the exhibition. There will also be a sales table with handmade miniatures and a raffle with a variety of prizes, as well as refreshments and home-made cakes. Barbara herself is a collector of vintage dolls houses, has a HUGE collection of dolls houses and miniatures, is a retired opera singer,biographer of Pauline Viardot Garcia plus as you can see from the painting above...a very talented artist too! So..if you are in Jersey this weekend....do try and go if you can and help the club raises lots of money for two well worthy causes. 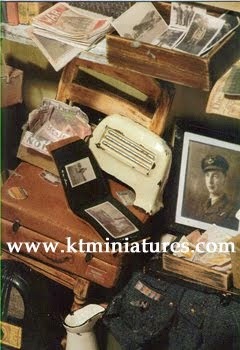 KT Miniatures Back From Hols....Now Open For Business!!! Just to let you know that I have literally just returned from my travels after being away for 12 days and that KT Miniatures is now back open for business. However, having switched on my computer I can see that I have dozens and dozens of emails in my inbox, some orders and enquiries that have been sitting there for quite a few days!!! My apologies for not getting back to you sooner but I will begin tackling the emails later this afternoon and should answer all emails shortly. Thank you for your patience. Tri-ang Windows Now Available - In Two Sizes! 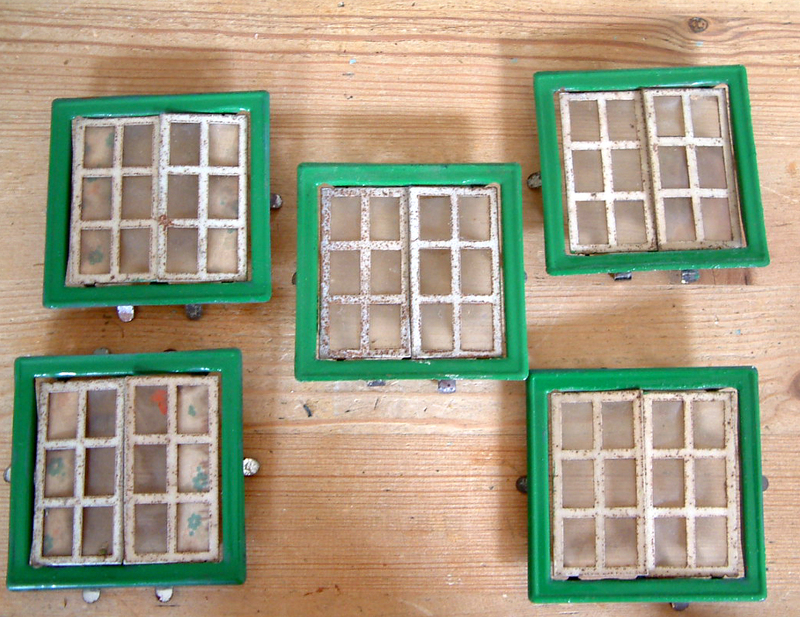 Several metal Tri-ang windows have just been listed for sale on KT Miniatures' website. These do not come along very often but a very nice lady has sold me some real vintage Tri-ang wrecks so the windows have come from them. There are three of the larger style windows from a 1930s Tri-ang No 76 model house. They are in excellent condition.... and even have the pretty blue and white criss cross material curtains. There are also several smaller style metal windows with green frames (have been touched up by the looks of it) that came from a 1950s No 62. These are in more of a played with condition, some rusty bits too. 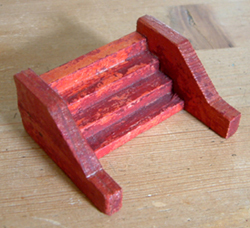 Finally....there is the elusive set of Tri-ang wooden steps. Always nice to have as they were so often lost. Just adds that nice finishing touch to your vintage Tri-ang dolls house...don't you think?